The following are the four nonfiction readers included for the month. One to pair with each book! I love the topics for each one and found myself learning A LOT! 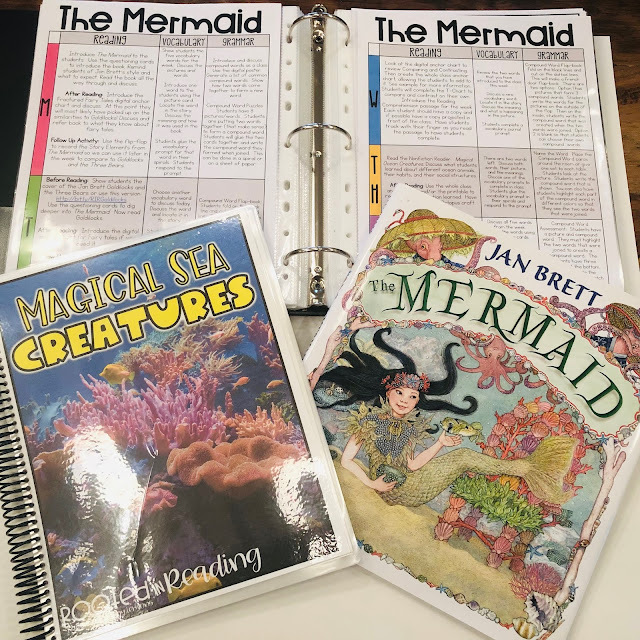 I haven't blogged a ton about the first grade units so I wanted to make sure you saw a good bit of what is in each one. 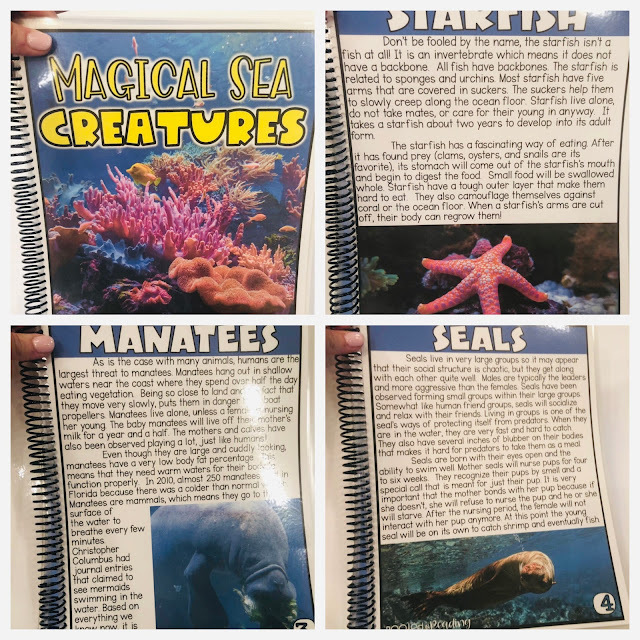 For the Magical Sea Creatures nonfiction reader, I chose to focus on the habitat AND habits of each animal. I think with more understanding of what lives below sea level, comes more compassion and effort to protect our beautiful oceans. 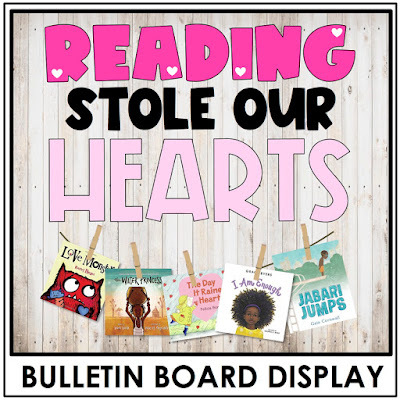 For each week, you will receive two to three digital anchor charts and relatively quick comprehension activities to allow your students to demonstrate their understanding of the whole group lesson. After The Fall offers a wonderful opportunity to review nursery rhymes that your students may or may not be familiar with. Have you ever read The Three Little Wolves and the Big Bad Pig? What a FANTASTIC book! I find myself giggling several times when I am reading it because I find the author so clever. And because it is SO hard to show you everything but I don't want to miss anything, here are some more images. You may click on any of the pictures to see the unit in Amy's store! 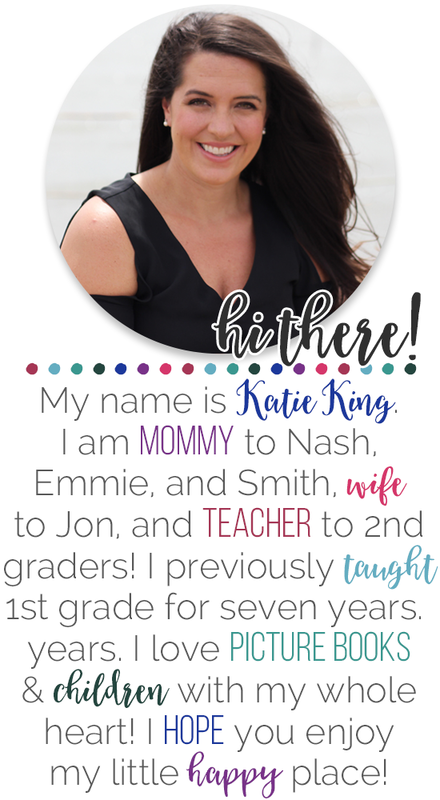 It's been a minute sine I have shared about anything non-school related, but I figured since a large majority of the country has caught the Marie Kondo bug that this might be of interest! Last Sunday I caught the organizing itch hard! I didn't even get out of my pajamas. I just spent the whole day tossing and bossing people around :) dreamy, right?? I started with the laundry room, where we have our "pantry". You would not believe the dates on some of the stuff I threw out! I love having baskets to group like items. It seems to keep us a lot more organized! I was trying to link some similar ones from Amazon, but they are all too expensive...just go to Walmart! I know I am a weirdo but I actually enjoy laundry...which is a good thing since 5 people equals TONS of laundry. After the laundry room, I moved on to the kitchen. We just loved to our home a year ago and luckily purged a lot then so I was able to go through all the cabinets and fridge pretty easily. Y'all it feels SO good to know exactly where everything is and have a clear mind with less stuff! The main reason that wanted to share these pictures is because I actually have found a few great organizational "things" to help keep everything in its place. All of Mr. Husband's things are organized and not rolling around in my drawers anymore! Next up was my vehicle. I spend a good 3 hours a day minimum in my car. Between getting Smith to therapies and all of the kids activities... I live in my car. It was making my crazy the amount of disorganization I was dealing with daily! First thing I realized was that I needed the whole family's help. So I have stressed to my kids that if they bring it to the car, they need to take it from the car! I also needed to reign in Smith's toys. I took a bunch out of the car for good and then started using a basic shower caddy for the rest. Plus I keep a few books handy because we are definitely a family of readers! 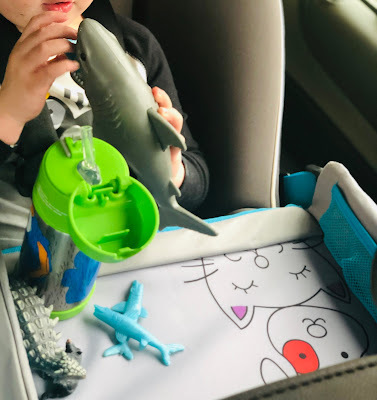 Plus I found this lap desk for Smith to play with his dinos and sharks on! He loves it and so does Momma because it keeps the mess contained and him entertained for hours! I also got this organizer for my trunk. It is a dream! I keep my yoga mat and other things that we need for activities. It has all kinds of pockets on the kids for wipes, sunscreen, bug spray, and water bottles. Seriously, such a good purchase! And the last place I have tackled so far is Emmie's closet. I have finally come to term with the fact that she is too old for me to pick out her clothes for her (10 in March) so I asked her to go through and let me know the things that she wouldn't wear anymore. Such a beautiful pile of clothe! Luckily we have lots of little friends to pass them down too! Even though I am not picking out her clothes anymore, I was able to pass down a habit to her. On Sundays Emmie picks out her clothes for the whole week and puts them in this organizer. We have done this since she was four years old and it is such a life saver for us! Here's a picture of the finished product of Emmie's closet! And just so you KNOW I don't have all my stuff together.... here is my next project to tackle! Book hoarders unit! If you are interested in seeing more organizational posts or home in general, make sure to leave my a comment. I would love to hear any tips you have! Did you have lots of great intentions for the week of Valentine's Day and now you are feeling all kinds of tired and overwhelmed. Yep, yep. I know that feeling. So let me help you out with some easy, print and go help! 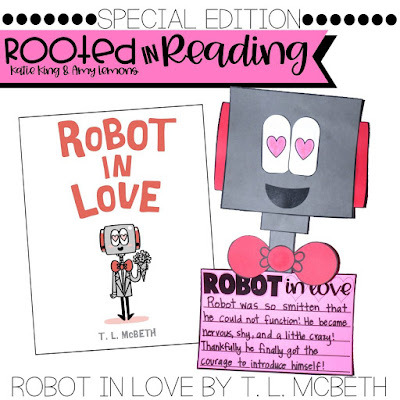 When Amy saw Robot in Love at Barnes and Noble, we both knew right away that it was screaming to be a Rooted in Reading book. So, we made it happen! 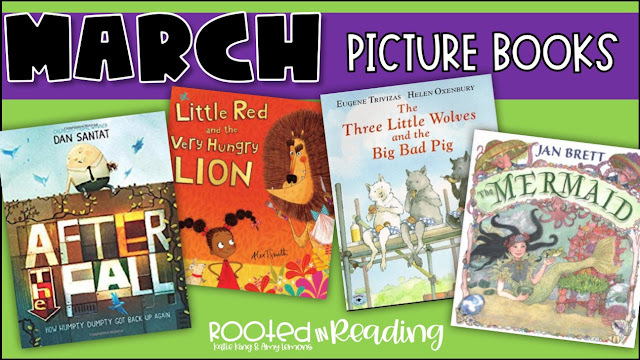 One of my biggest frustrations with adults is when they do not understand the complexity and rigor that picture books offer to our students. The amount of stuff going on in these illustrations is amazing! 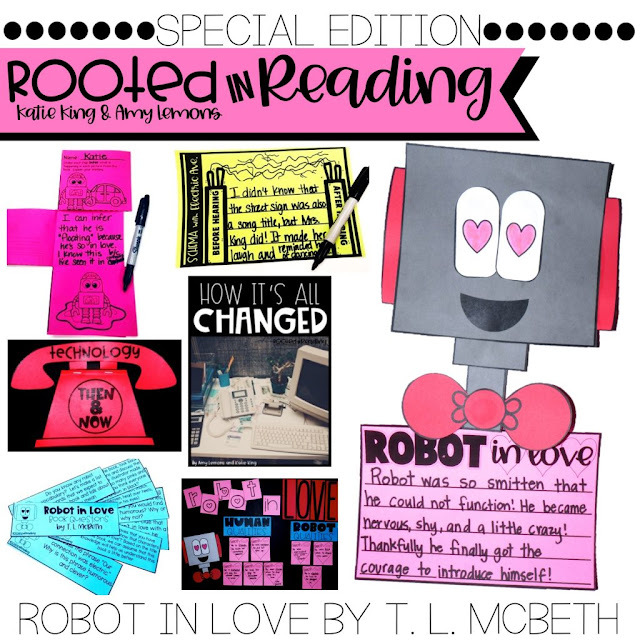 We need to talk about how characters act when they are "in love" and what is happening when the robot lands in the puddle. We can't assume that kids have been exposed to enough of the world to really GET it. And, folks that is what we do in Rooted in Reading. We zoom in. We give them time to talk and analyze. I also LOVE using animated short films to really hit a Grand Slam with the kids. 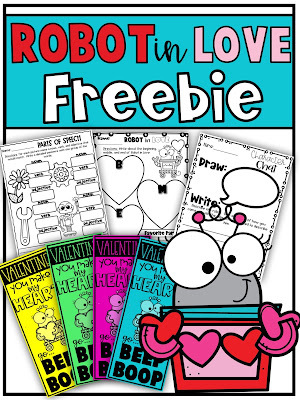 This "Cupid Love" video is a perfect addition to use alongside Robot in Love and gives students a chance to infer without the pressure of decoding words at the same time! 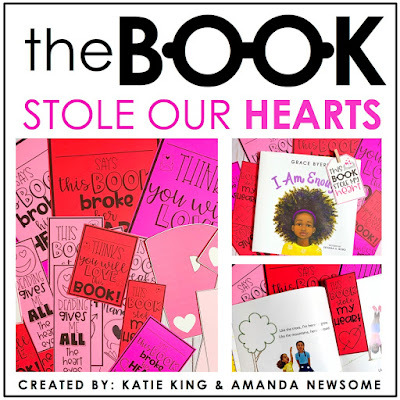 AND since I decided to be an overachiever this week, Amanda Newsome and I decided to team up on a little Book Freebie. 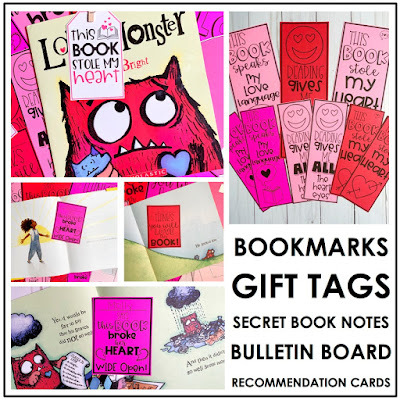 It comes with MORE bookmark options for any book, tags to use with gifts, book recommendation cards, AND a bulletin board idea. Phew! Look at the pictures below for more insight. I hope that you are winding down from the week and preparing for a weekend of relaxation and rest....right?!? !